The Home Front Spiral Slide is designed to fit a 1.5m (5′) high platform as found on the Home Front Jungle, Cosmic, Lunar and Mountain ranges. They are a great alternative to the 3m slides, and proving very popular with customers. The slide arrives flat packed in 8 segments, and we have discovered it is much easier to assemble when on flat ground. Usually available in green or yellow. 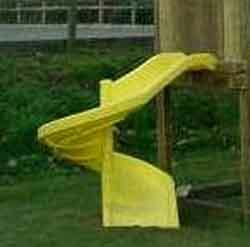 Dimensions: Width of slide channel – 45cms. Required platform height – 1.5m. Footprint area – 1.5m x 1.5m. Ground anchoring: The centre tube has a 50cms extension for setting into the ground. Ideally in concrete (Postmix). Dimensions: Width of slide channel - 45cms. Required platform height - 1.5m. Footprint area - 1.5m x 1.5m.